Smartdip is a digital foundry pyrometer used to measure, display and store the temperature of molten metal. The battery powered portable unit searches, holds and displays the peak stable temperature with a single button operation. It then stores the time, date and temperature reading which can be downloaded to Windows compatible software. The unit is ranged to use type K, N, B, R or S thermocouples, which will change depending on the application and type of metal being measured. The unit is housed in a tough, lightweight aluminium case which is ideal for the rugged foundry environment. It is supplied with a 1.2 metre stainless steel dip arm fitted with the thermocouple connection of your choosing. DPP ‘K’ is ranged for use in non-ferrous molten metals only and is designed for use with expendable KWIK-TIP thermocouples or swaged thermocouple elements. 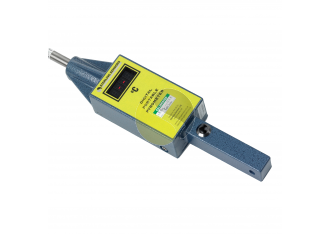 DPP ‘B’, ‘R’ and ‘S’ can be used for temperature measurement of both ferrous and non-ferrous molten metal. They are supplied for use with multi-use expendable thermocouples; the dip arm comes cpmplete with an expendable thermocouple connector.